This 9mm Luger ammunition belongs to Corbon's Powrball series, which is named for its unique bullet design. 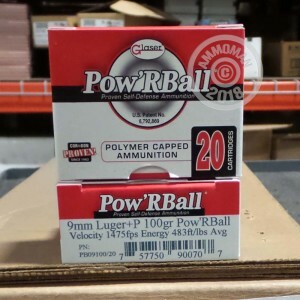 Powrball bullets consist of a jacketed bullet with a wide expansion cavity that is capped by a polymer ball. The ball provides this ammo with the feeding reliability of full metal jacket ammunition, but behaves more like a polymer-tipped rifle projectile upon contact with the target: it pushes the rest of the bullet outward into a wide mushroom shape for maximum terminal performance. These +P cartridges come in boxes of 20 and fire a 100 grain Powrball bullet at muzzle velocity of 1,475 feet per second. This results in strong expansion potential, significant but manageable recoil, and low risk of overpenetration. Corbon ammunition is loaded in Sturgis, South Dakota and uses non-corrosive Boxer primers and reloadable brass cases.